Here's Robin denying that he had anything to do with destroying my roving while I ran next door for the camera. The rat! 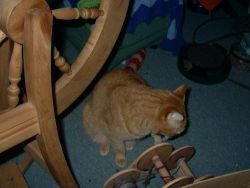 I spent most of today spinning the carder waste roving into tiny thread for a 3 plied yarn. Still have about half to go. Made a nice three ply yesterday from some unknown wool and some Samoyed. The wool is not as soft as I'd like, but the yarn turned out very well, I think. This is where she like to nap. She can watch out the window (white spce behind her… yes, it’s all snow) in case a bird or squirrel comes to breakfast on the seeds and nuts I toss there. All the afghans are to keep the cat hair on my antique love seat at a minimum this winter. This cap is one of the projects in the big book “Weaveing On Hazel Rose Looms”. Easy to make using your warm handspun bulky wool yarns. Or another bulky yarn at hand for that matter! No bulky? Use two strand of regular worsted. Pop’s 90th went well. Here he is shaking hands with Randy’s grandmother who will be 100 next August. As usual I forgot my camera until we were all getting ready to leave. It was a happy and festive occasion, anyway, and several old friends came by, as well as all family within reach. This is the new knitting loom. It has nails with 1/4″ centers and the gap spacing adjusts from 3/8″ to 1″. There are some knitted samples so you can see the fabric on the next page. I am having fun with this new knitter. It makes very nice fabric! You can take it home and hang it on the wall, or you can turn it over and cut the warp string at the center of the tray. Be sure your ends are woven in and treat it gently once it’s off the loom. You will now tie the warp ends.